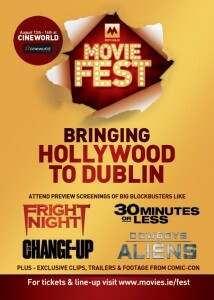 For those of you, like me, who sat idly by (read: cried) as droves of your Twitter friends geeked-out about the goings on at the San Diego Comic-Con, the wonderful people over at Movies.ie have teemed up with Cineworld and a host of other people (Sub City Comics, IFTN, Micromedia, Phantom 105.2 and The Pictureworks) to bring SDCC to Dublin. Inspired by Empire’s Movie Con in London, the aim is to bring the best movie footage and exclusives to the Irish audience. It all kicks off at 10.30m the weekend of the 13th, with both the Saturday and Sunday jam-packed with premiere screenings, exclusive trailers, behind-the-scenes looks at upcoming movies, give-aways, lots of exclusive swag and a great atmosphere to boot. The screenings that are definitely happening are 30 Minutes or Less, the new Jesse Eisenberg movie, Cowboys & Aliens, the new Jon Favreau blockbuster starring Daniel Craig, Harrison Ford and Olivia Wilde, The Change-Up, the new comedy (ahem) from the writers of The Hangover starring Jason Bateman (how many movies has this guy made this year, seriously?) 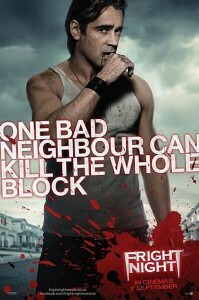 and Ryan Reynolds and the 2011 remake of Fright Night starring our very own Colin Farrell. Plus there will be a “Mystery Screening” each day, with one tipped to be Oscar worthy and the other one set to blow your socks off. If all that’s not enough, there’s some exclusive pre-recorded greetings from top directors and actors including Guillermo Del Toro, Stephen Spielberg and Peter Jackson along with exclusive footage from Don’t Be Afraid of The Dark and Tintin. 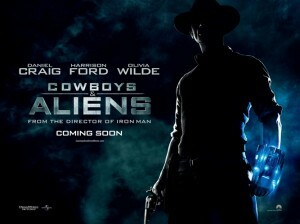 And of course a host of trailers and sneak-previews. Tickets are selling fast, so make sure you nab yourself one on the Cineworld website or in person at Cineworld on Parnell St.